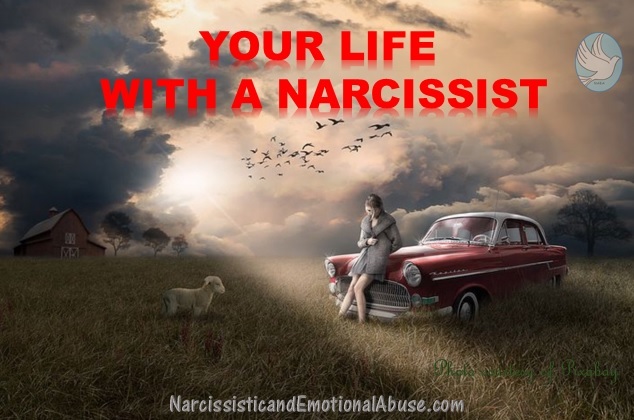 Anyone can be a target of a narcissistic personality. 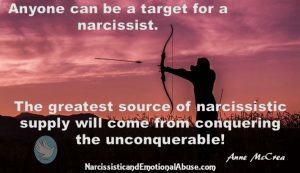 The greatest source of narcissistic supply will come from conquering the unconquerable! If they can manipulate someone who can advance their status, this would be considered a great achievement. I look at this from the mind-set of a mountaineer. At the beginning of their quests to climb mountains, the mountaineer will start off small, and with every successful climb, they will want to go higher the next time. Eventually, they won’t get satisfaction unless their climb is more difficult and more challenging than the one before. Their life goal will be to conquer the biggest and the highest mountain. 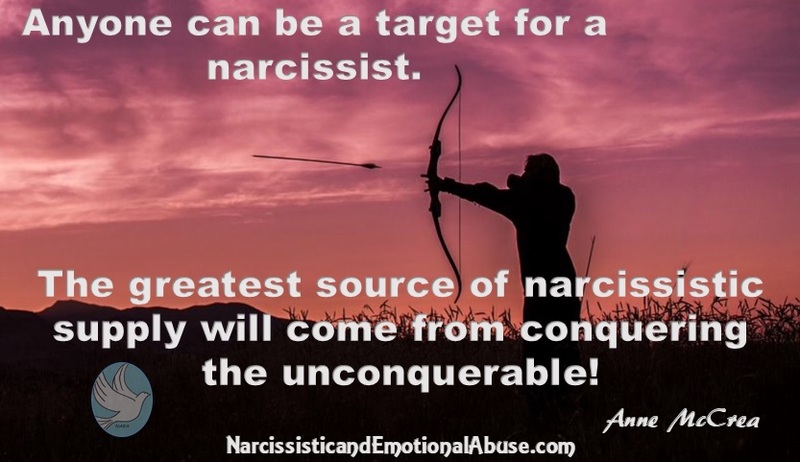 The narcissist’s greatest challenge and achievement will be to conquer the strong and powerful. 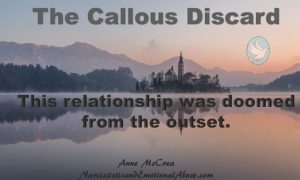 Once having achieved their goal, the narcissist will attempt to tear down those very same attributes that attracted them in the first place. 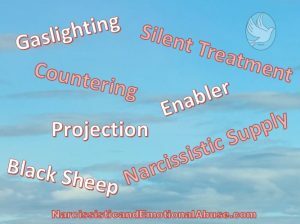 Under the mask of the narcissist, is often a person of rather low self-esteem, even though to many, they may appear to be confident and assertive. 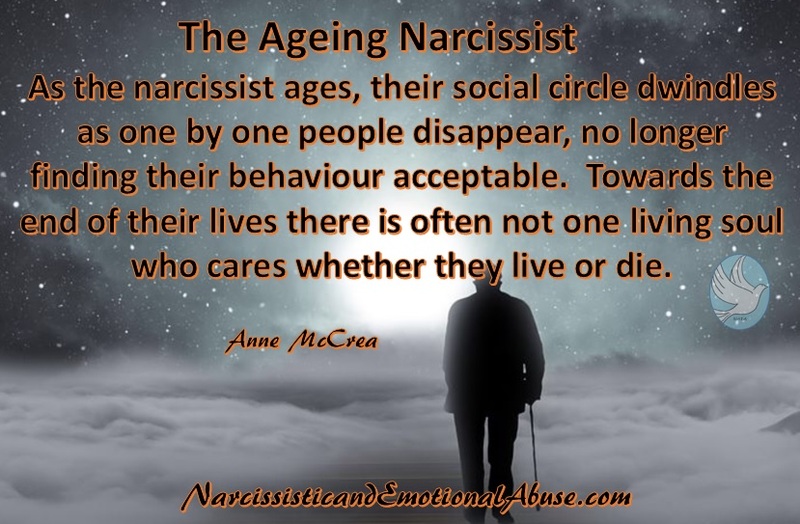 They need to have their fragile egos fed, having a regular source of narcissistic supply which in turn makes them feel superior. They want others to be envious of them and their chosen partner. Narcissists generally do not have any respect for weakness of character. 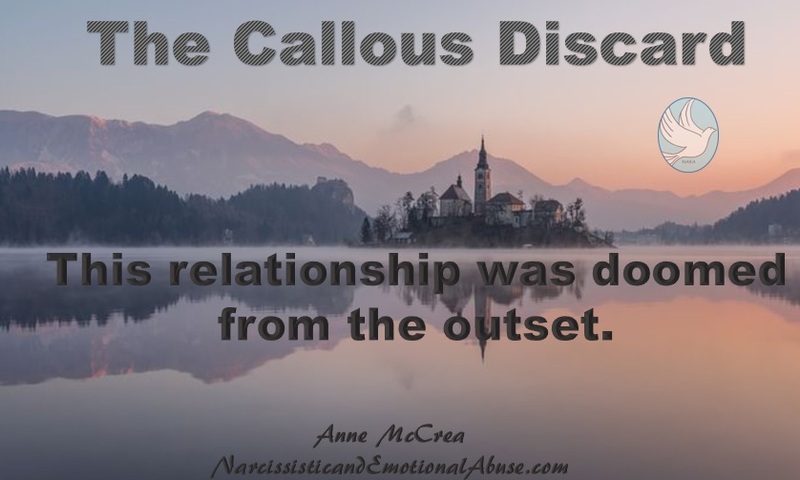 However, weak people who are easily manipulated are seen as soft targets, and the narcissist may choose someone who is sad or insecure on a temporary basis, until someone better comes along, when they will unceremoniously cast aside and dump the weak person. 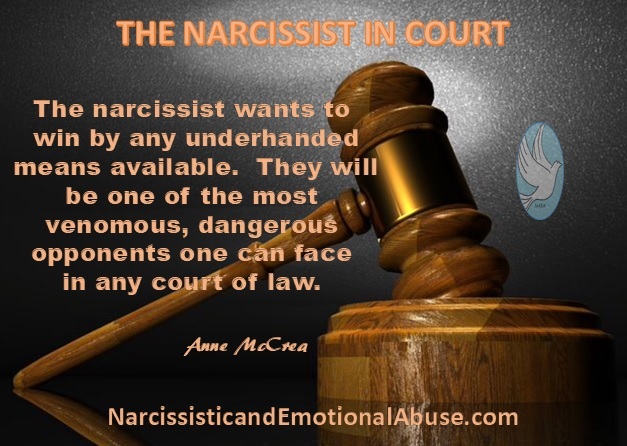 The narcissist will feel threatened by those who are more popular than themselves and those who they believe to have integrity and strong morals. 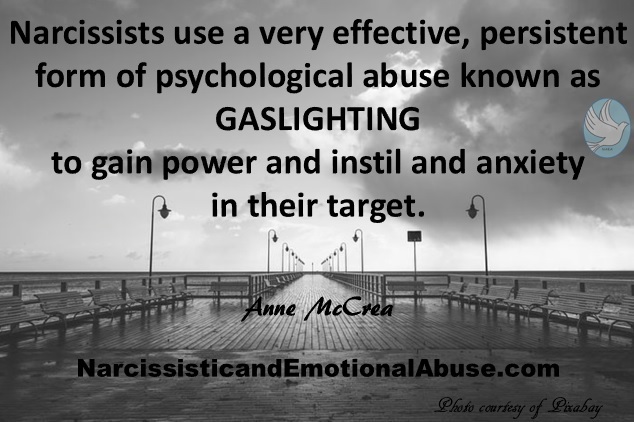 In some cases, the narcissist will target such people, for no other purpose than to bring them down. Once the narcissist has picked their target, they will go all out to prove to this person that they have met their soulmate. Their goal will be to make this totally independent, strong person, utterly dependant on them. They will have to work hard to rise to the challenge but once accomplished, imagine the boost to their ego. Once they have you where they want you, they will slowly but surely chip away at your self-confidence so that eventually you become a shadow of your former self. 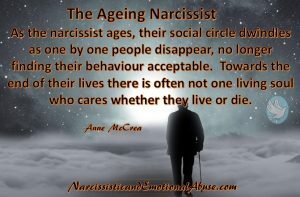 The narcissist is attracted to the self-sufficient, independent individuals as they will be less likely to have to take care of their needs. Narcissists are envious of those who are happy and content. If you have a passion for life, they will try to make sure that it won’t last long. How dare you be happy, when they find it impossible to ever find such a state of contentment? They will seek to destroy your happiness just to make themselves feel better. Narcissists don’t like being upstaged in any way. If you are the type of person who doesn’t feel the need to take centre stage, you’ll fit the bill for a time. You will be less likely to take the spotlight away from them. If you are a perfectionist, you may be targeted because you will want everything to be perfect and you will go out of your way to achieve perfection. You will want to receive their approval for a job well done, but as an acknowledgment is extremely unlikely, you’ll try harder next time. You always try to please, doubting yourself and thinking that whatever you do is never good enough. The narcissist will pray on the empathetic people in this world, the most compassionate, loving and kind people. Someone with such a kind and forgiving nature is much more likely to forgive them time and time again. 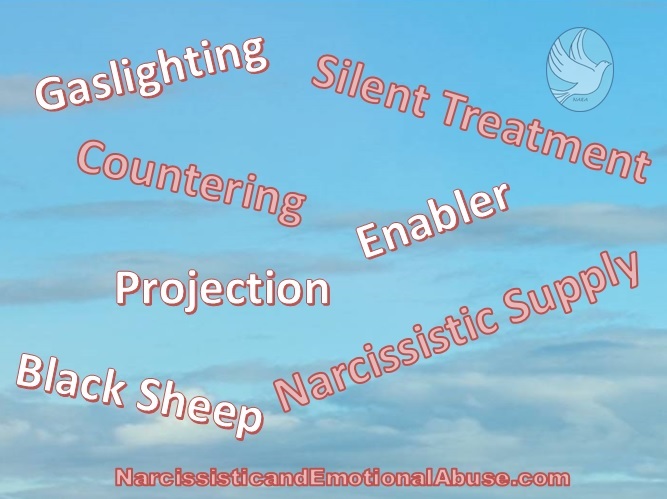 Sometimes, if strong, independent targets are unavailable as a source of supply, the narcissist will choose someone who will be an easy target for their manipulation, someone who they see as weak, someone who may be recently divorced or someone in mourning. The depths of their immorality and depravity knows no bounds. Exploiting the vulnerable will give them a lesser degree of supply, but it will be enough until a new source of supply has been established. It took me a long time to get to a point in my life where I no longer give a damn what people think. The less I give a damn, the better my life becomes. From now on, I’ll do what I believe is right. My conscience is clear. There will always be those who try to find fault where none exists. Let them. There will be those who are looking to be offended. Let them be offended. These are their problems, not yours. There are some who will be angry with you for what you’re doing. Let them. Do it anyway if you know it’s right. There will always be people whose lives are so boring that they can’t keep their nose out of everyone’s business. Pay no heed. Some people have nothing better to do with their time than cause upset and frustration to those around them. Their behaviour says a lot about them. Distance yourself. Some people will be green with envy and jealousy. They’ve got issues they need to address. Let them go. There will always be liars and people who try to put you down. You don’t need them in your life. In time, the liars get caught out in their lies and those, who believed all that s**t, well, you’re better off without them. 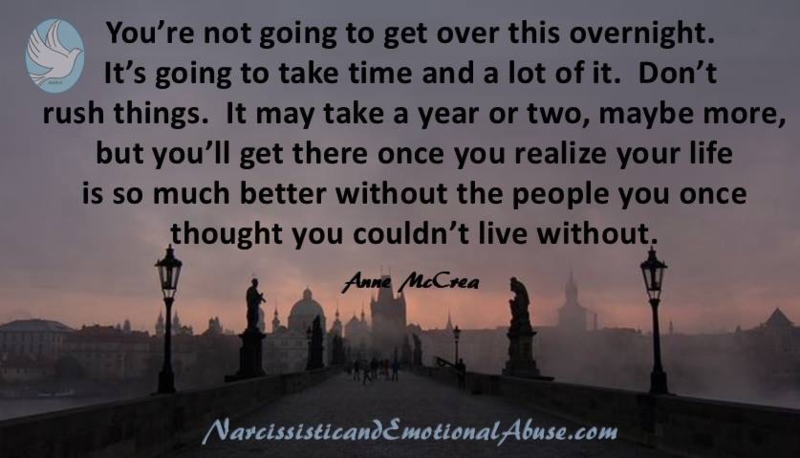 As time passes, you’re circle may get smaller as you weed out these people who never had your back in the first place. You can replace these degenerates with honest, reliable folk who have the same values and morals as you do. You’ll see that the people’s opinions you once cared about are long gone. Be choosy about those damns that you give. 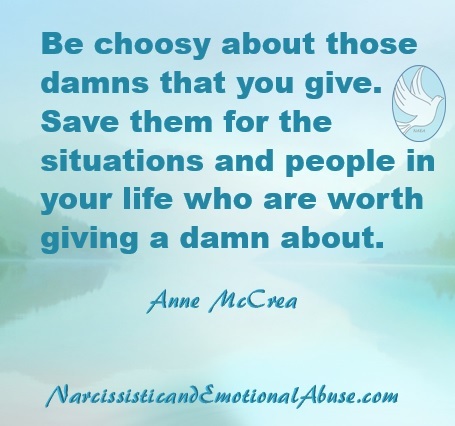 Save them for the situations and people in your life who are worth giving a damn about. Some narcissists will use social media to get attention. Others will use the likes of Facebook and Instagram to stalk, creep and keep an eye on you, your family and what you’re doing. There’s a big difference between nosiness and fixation. 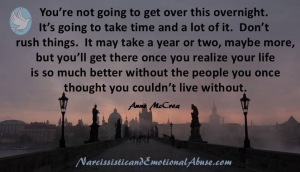 Narcissists don’t like to lose control, let go and they struggle to come to terms with the fact that you have moved on with your life. They find it almost impossible to keep their nose out of your business and their spying may become obsessive. This type of behaviour is not normal by a long shot. These online creepers have problems in their own lives that they need to address. Unfortunately they will rarely see a problem with their conduct. 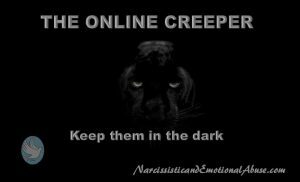 Mentally stable individuals who have happily moved on with their lives will have no desire to creep online. They don’t want to see what people who are no longer a part of their circle are up to. It doesn’t matter how much time has elapsed since you last had any form of contact with these paranoid individuals. Their crazy behaviour may last for many years. Most of the time this online creeping often will go unnoticed by the person being watched. However, sometimes these online sneaks slip up and leave a trace. They accidentally hit a like button, realise their stupid mistake and quickly hit the button again hoping to remove all traces that they’ve been watching you. Alas, it doesn’t work that way. They’ve been found out. For some, online creeping may turn into something much more sinister such as continual stalking and harassment which I will cover in another article. 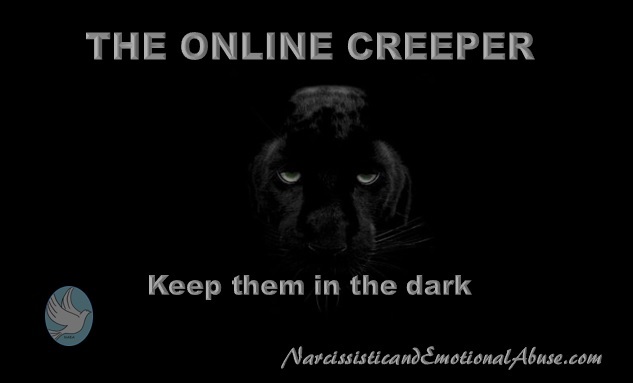 In the meantime, if you want to keep your life private, keep your profile locked down and keep those little online creepers in the dark. 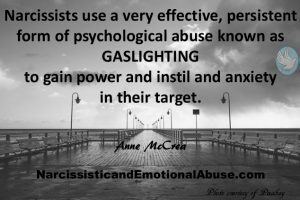 Narcissistic and Emotional Abuse, Shattering the Illusion is now available on Amazon.